First I showed how to cut 60° Triangles. 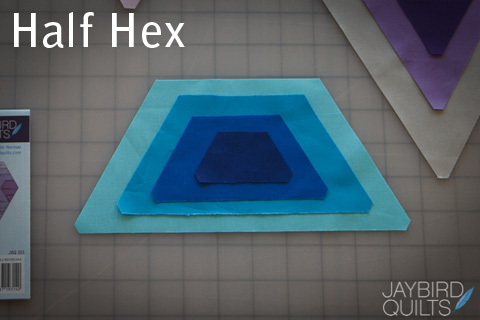 The next shape we are doing to cut is the Half Hex. 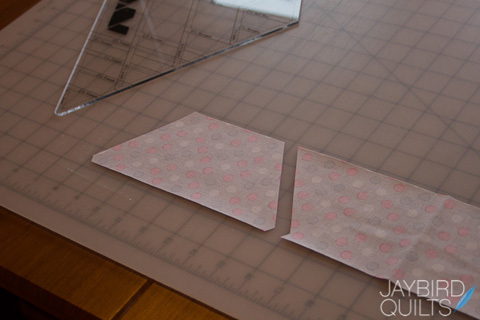 It is the second easiest shape to cut and you also have little to no waste when cutting them. 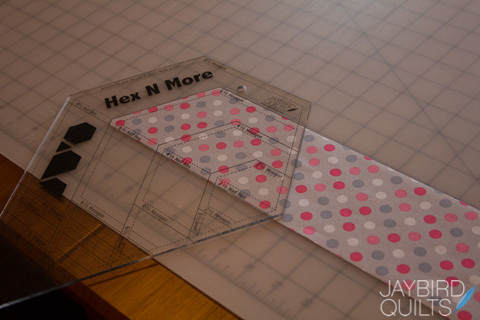 The Hex N More can cut four sizes of Half Hexagons. 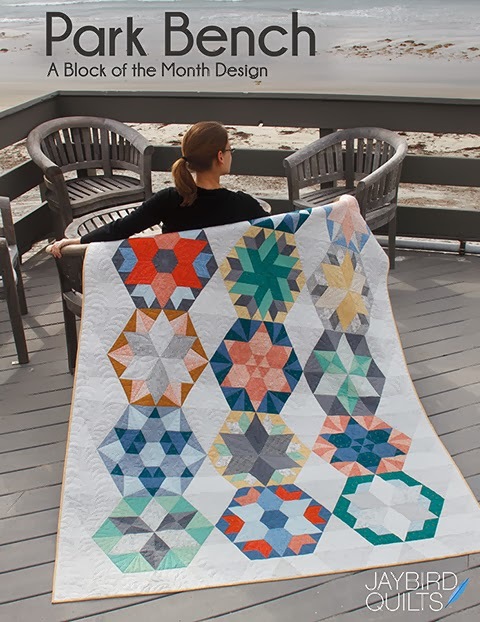 The measurements are based on the size of a full hexagon. This means that the 6" Half Hexagon will measure 3" finished in height. 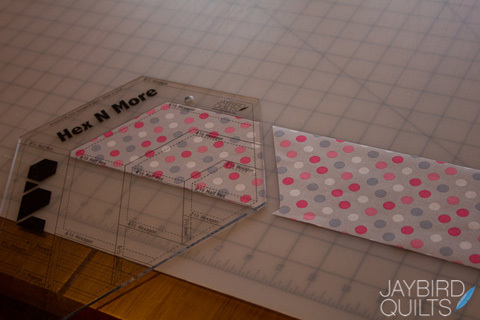 Four Sizes - 2", 4", 6", 8"
With today's tutorial I'm demonstrating how to cut a 6" Size Half Hex. 2. 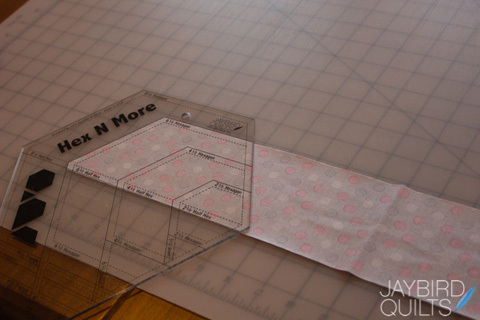 Place ruler as shown aligning the top of fabric strip with the solid horizontal 6 1/2" hexagon line, and the bottom of fabric strip with the solid 6 1/2" half hex line. 3. 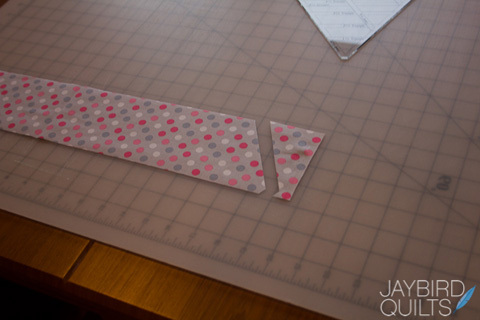 Cut along right edge of ruler to trim strip. 4. Flip fabric over to the wrong side. 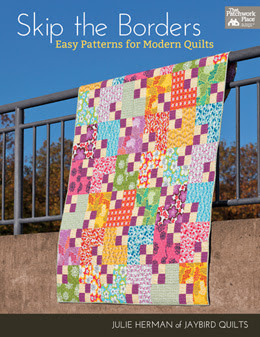 Align cut edges with solid 6 1/2" hexagon and 6 1/2" half hex lies. 5. 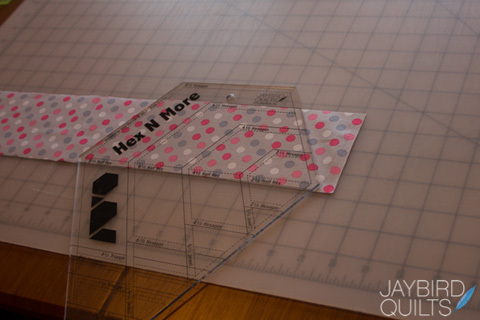 Cut along right edge of ruler to complete half hex. 6. 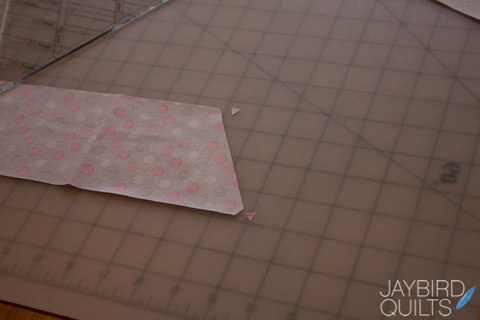 Turn strip around 180° to cut the next half hexagon. Align ruler and trim off dog ears. 7. Flip fabric back over to the right side. 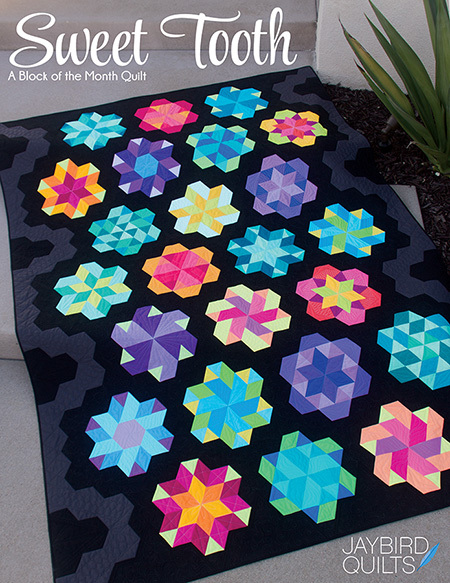 Align cut edges with solid 6 1/2" hexagon and 6 1/2" half hex lies. Cut along right edge of ruler to trip strip. I love the built in corner trimmer. Wish the Lazy Girl ruler had that. 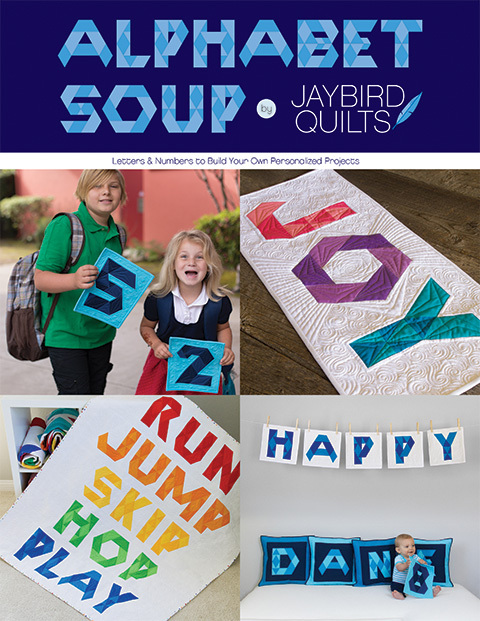 I am eagerly waiting for mine to get here from fqs. 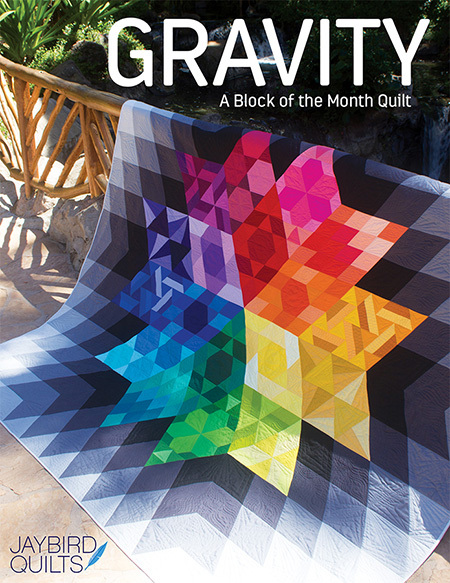 this might sound really stupid, but I am pretty new to quilting and have never used a tool like this, but would love to buy one. My question is... how do you use the same tool for the different sizes on it ... like how do you align everything up? I really do love your ruler more with each tutorial. Thank you for another great tutorial. I love your ruler Julie! 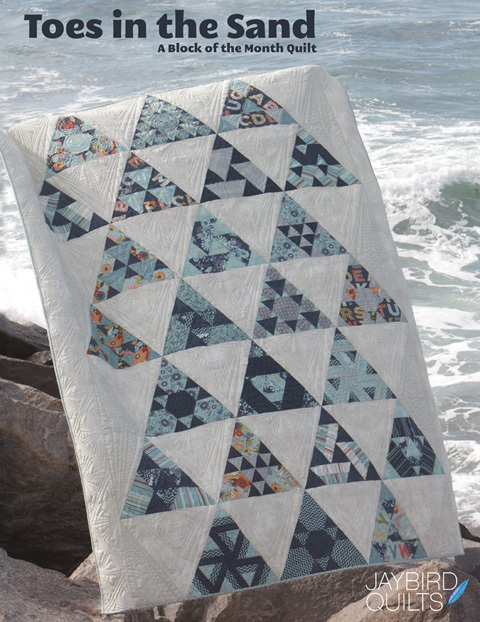 I'm headed to Colorado in a couple weeks to teach a class and the quilt I'm teaching uses a lot of 60* triangles, I'm thinking I may need to order a few of your rulers and take with me. Clever girl I so love this ruler, of course the you had me at the hexs! I just found my ruler on the doorstep...woo hoo! Gonna have some fun now... Thanks for the tutes, too! I am concerned that the strips might shift when you flip them over and over. 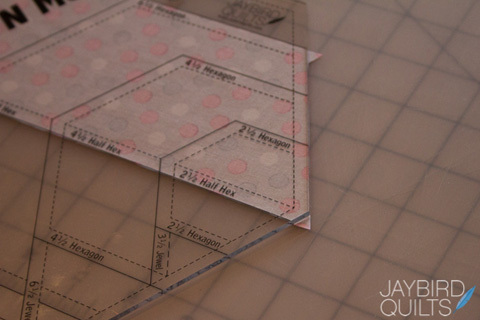 If the fabrics are pressed together before cutting it should help. Any thoughts? Love the fact that one ruler does so many things. 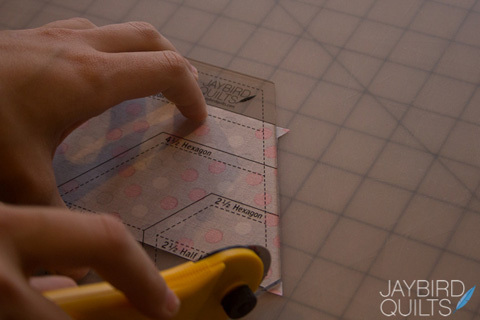 This is a great tool, Julie!